The Fifth Vermont Volunteer Infantry suffered a larger percentage of killed and mortally wounded in action (12 percent) than any other Vermont regiment fielded during the Civil War. To its original 986 members were added 631 recruits and men transferred from other units. Of these, 205 were killed or wounded in action; another 130 never lived to see their beloved Green Mountains again, and 410 went home early due to wounds or other disabilities. Its honors include most of the battles of the Peninsula, Shenandoah and Overland Campaigns, and from its ranks emerged a brevet Major General, a brevet Brigadier General and four Medal of Honor recipients. "No Braver Deeds" is based on the prolific correspondence of Private Cyrus Hard, articles from the Manchester Journal and other primary and secondary sources. 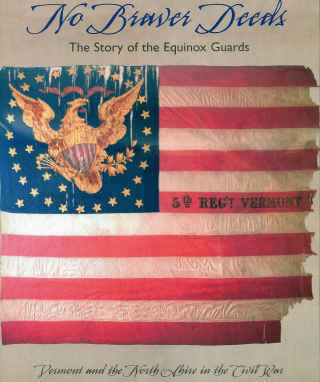 It shares the story of the 87 members of the Equinox Guard who joined the Vermont volunteers from the North Shire of Bennington County, becoming the major portion of Company E. Like many soldiers from across the country, "they were innocently blinded by the prospect of a glorious and noble war." Like many soldiers from rural areas, they suffered inordinately from disease during the first winter of the war. And like many soldiers in the First Vermont Brigade, they suffered greatly in battle. Author Brian Knight paints an intimate portrait of the town from whence most of these soldiers came. Manchester was a 'model town' of 1,800 inhabitants, lacking much of what today one would consider basic infrastructure; it has no formal fire district, no community water supply or sewage system. The local Manchester Journal published local gossip, town activities, family tragedies and inklings of the coming war. But in the summer of 1861, the newspaper reflected a change in the town "as the young men of the North Shire laid down their hoes, axes and pens to pick up rifles in order to save the Union." The letters home to family and the newspaper over the first winter were fairly typical; the ennui of camp life, concerns about missing letters and boxes of goodies from home, significant concern about the sickness that raged through the regiment, and endless picket duty, drilling and inspections. Homesickness and the desire to get started with the job they had been hired to do were also prevalent. During the war, Company E lost 37 killed and mortally wounded, out of a total of 191 listed on the roster, nearly 20 percent, more than any other single company organization from Vermont. In one battle alone, on June 29, 1862, at Savage's Station, where the Fifth Vermont lost 188 men in a period of thirty minutes, Company E lost 25 killed or mortally wounded and another 19 wounded, out of only 59 mustered for the battle. Most of the Company E casualties were members of the Equinox Guard. One of the biggest tragedies to emerge from this battle was that which affected six of seven members of extended Cummings family of Manchester. Henry, wounded and taken prisoner, was later released and discharged because of his wounds. His brothers Edmund, Hiram, Silas and William were killed or mortally wounded, as were Horace Clayton, the husband of their sister Laura, and a cousin, William H. H. Cummings. The majority of the work covers a period of less than a year, from mid-August 1861, when the Equinox Guard was originally mustered, to June 29, 1862, the battle of Savage's Station, for the simple reason that only sixteen percent of the original number made it past that fateful date. From their initial muster in Manchester, to the camp in St. Albans, to the "seat of war," to the battlefields of the Peninsula Campaign, the patriotic, courageous members of the Equinox Guard had dwindled from their original 87 to 14. Soon after the battle of Savage's Station, then Lieutenant-Colonel Lewis A. Grant wrote a letter to the Manchester Journal, expressed the hope that the names and exploits of the Equinox Guard, just recently decimated at Savage's Station, be "preserved in the archives… and handed down to future generations." In producing this book, Brian L. Knight, curator of Hildene, the Robert Todd Lincoln estate in Manchester, took up Grant's challenge, presenting to the public for the first time, the exploits of these patriotic men. He has produced a well documented and well illustrated documentary. "No Braver Deeds" is an outgrowth of Hildene's recently opened (June 1, 2004) exhibit, "Vermont and the North Shire in the Civil War: The Common Experience of Uncommon Valor." Based on what is contained in the book, the exhibit is a definite "must see." Tom Ledoux is the creator and webmaster of the Vermont in the Civil War web project, VermontCivilWar.org. He has an M.A. in military studies (Civil War studies) from American Military University. Supposed to be available from Robert Todd Lincoln's Hildene, but it hasn't shown up on the site yet. Notes of Army and Prison Life 1862-1865.